Before we bid good-bye to Vigan we took a quick visit to Calle Crisologo to have a picture of this prime tourist attraction in broad daylight. And it’s good to see the cobbled pathway with less crowd compared the other night. Can’t hide my excitement while we were on our way to Bangui Windmills, the prominent trademark of Ilocos Norte. I remember how I was astonished looking at the swirling giants stood firmly like a military army protecting its base. That was five years ago, and now I am back with my family. So happy. From Cape Bojeador Lighthouse, we now proceeded to the most anticipated part of our Ilocos Norte adventure, into Kapurpurawan Rock Formation. This is not included in my former company outing in 2010 because the road leading to this stunning rock formation was rough and bumpy, not that accessible yet to visit. 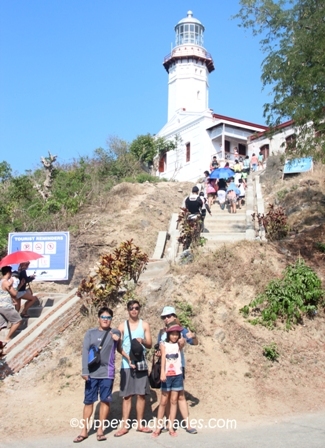 Coming from Malacanang of the North, we headed to Cape Bojeador Lighthouse. 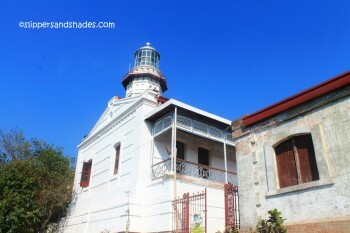 Also known as Burgos Lighthouse, this cultural heritage structure is located on top of a hill called Vigia de Nagpartian Hill in Burgos, Ilocos Norte. 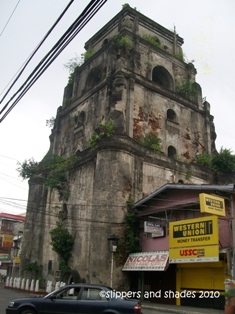 The 66-foot-tall (20 m) octagonal stone tower overlooks Cape Bojeador and the scenic West Philippine Sea. 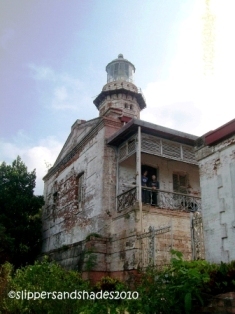 I was fascinated of Burgos Lighthouse the first time I set foot in here five years ago with my former office mates. It was lean season so we had the old structure all by ourselves. It was a month of October, though sunny, the wind at the tower was so strong. Oh I missed that moment where we were allowed to go up and experienced what is it like to be on top of a lighthouse. 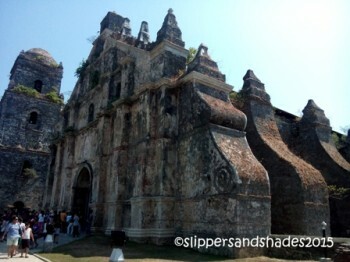 As expected this Holy Week, this famous tourist destination was packed by visitors. At the entrance, we were advised by the police on duty to park our van near the highway because parking lot at the base of the lighthouse was full. We boarded a tricycle (P100 two-way) and went up. Going up the lighthouse was so accessible. We took the flight of stairs and presto we were at the courtyard mingling with the crowd. To our dismay, the lighthouse was under renovation. We miss the adventure of getting inside the main tower because it was closed. What’s new this time? Exterior walls including the red-bricked wall and the tower had been re-painted, all in white. 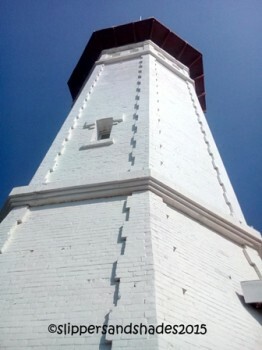 The miniature lighthouse, the only display item inside the museum was placed outside because renovation is still going on. Gone its old world charm that fascinated me much. Bumping here and there with the crowd was fun. We spent our time grasping the fresh wind and watching the breathtaking view of the sea at the pavilion. Best time to visit Burgos Lighthouse is between the months of June to August because of less crowd and the monsoon was moderate. Not very wet and not very cold. There are stores selling t-shirts, food, soft drinks, souvenir items and bottled water. 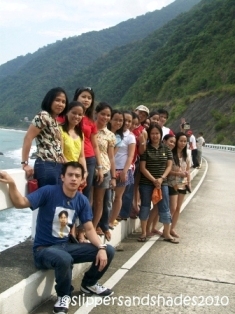 Accounting team had finally set our Ilocos Norte getaway. It was Sir Alex, our boss who made the itinerary. It is a long journey by land going North. 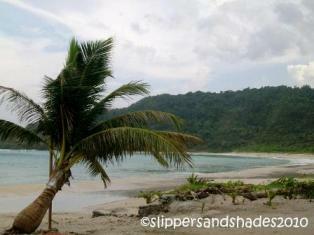 But I’m sure getting to famed beaches of Pagudpud with my team, will surely be a worthy vacation for all of us. We rented a service van from a local of Laoag which Sir Alex found the contact number through the internet. This includes pick-up service in Laoag, one day tour and transport service to Laoag City domestic airport for our way home on Sunday. Rate – P3,000. Thursday night, we boarded in Florida Bus in Espana, Sampaloc and went off by 8:30 pm. We reached Laoag City around 5 am. We took a tricycle ride going to city proper and had our breakfast in McDonalds near the Sinking Bell Tower. We went to St. William’s Cathedral but since it was closed we just walked around beside the church. Later we headed to Sinking Bell Tower, while waiting for our service van. We were fetched by 8 a.m. Here are the places we visited for our first day. 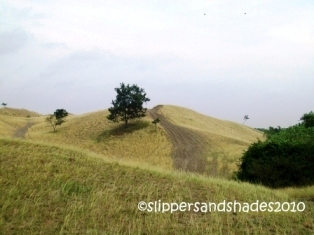 Sand Dunes – is located in La Paz in Paoay, Laoag. We explored in the vast area full of sand and had our first exciting photo shooting. But we didn’t went far because of limited time. 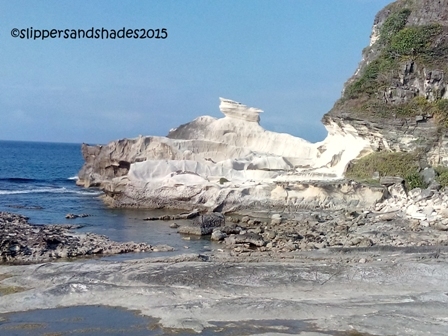 We missed seeing the location where the movie “Ang Panday” which starred our very own Fernando Poe Jr. was shoot. Anyway, it was a rewarding feeling seeing a rare geological creation which I only saw in the internet. Cape Bojeador Lighthouse – also known as Burgos Lighthouse is a cultural heritage structure built during Spanish colonial time. I was not a fan of a light house but our encounter with Cape Bojeador Lighthouse awaken my curiosity. From the parking lot, its prominent octagonal shape tower looked so imposing. It was an easy climb as we hiked a flight of concrete stairs and presto, we were in front of the rustic gate. 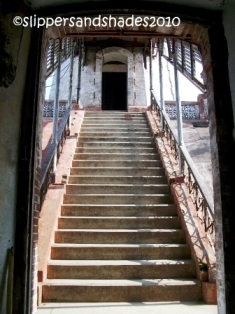 We kept on walking until we reached the pavilion made of red bricks. From the veranda, we enjoyed watching Cape Bojeador and the South China Sea. It was quite creepy walking around but we never stop from there. We took the spiral staircase in getting to the tower and there we had the thrill of our lives. 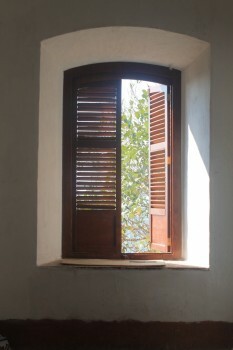 The view got even better as we peeked on the window and I loved the air brewing wildly into our skin. We went inside the museum which was along the hallway, kinda creepy and headed back to the veranda for a picture taking of the whole group. Lighthouse amused my senses and I love to see more in the future. From Burgos we headed to Bangui to see the site of the famous Bangui Windmills in Bangui Wind Farm. The beautiful white gigantic wind turbines, clear blue skies, cool air and the blue sea warmly greeted us. 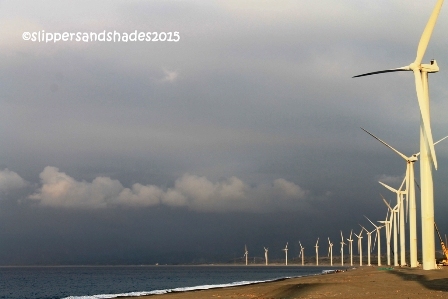 I was astonished standing beside one of the 15 wind turbines lined-up in a 9-kilometer stretch along the beach. Walking on the shore was the next big thing to do after photo shooting. But we were not allowed by our driver to swim on the beach because of electric current on water. Whether it was true or not, we didn’t step our foot on the water. 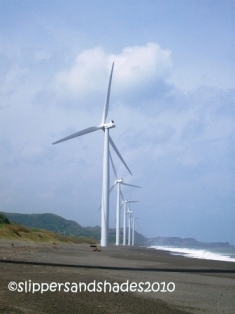 Aside from its 40% significant energy source in Ilocos Norte, the Bangui Windmills is also one of the top tourist attractions in the region. There were stalls selling souvenir items and refreshments near the shore. 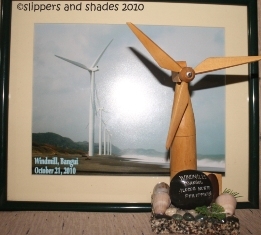 We bought beautiful wooden windmill display item which ranges from P50 to P100 depending on sizes. I bought also a small windmill key-chain for P30 and bracelets for P80. 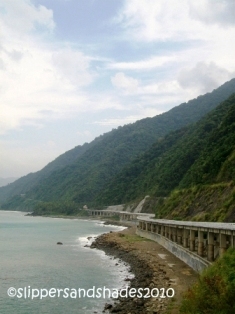 Patapat Viaduct – is in the municipality of Pagudpud, 1.3 kilometers concrete bridge connecting Maharlika Highway from Laoag, Ilocos Norte to Cagayan Valley Region. It is the fourth longest bridge in the country. 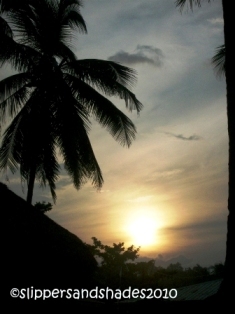 Its beautiful curves, surrounding mountains and stunning view of Paselang Bay were worth the visit. We had our souvenir photos beside the railings and on the road. Our driver told us that the viaduct was built to avoid landslides which causes vehicular accidents in the area. There was another tourist spectacle found here, the Mabugabog Falls, a mini-hydro power plant which was just beside the winding road. Bantay Abot Cave – a “mountain with a hole” is located on the shores of Baranggay Balaoi. As we were approaching the cave the sky was getting cloudy. We were so excited as we hopped our from our van and headed down to the walkway. But unfortunately, rain poured without any warning. We have no umbrella so we all went up so fast hurriedly to avoid from getting very wet. Just a few kilometers from Bantay Abot Cave was Baranggay Balaoi’s white-sanded beach the Blue Lagoon also known as, Maira-Ira Beach. Thank God heavy rain stopped when we reached this resort, which is more like a cove than a lagoon. I was the only one who hopped out from our van so I took my precious time to walk around. I was fascinated by the creamy white sand, its fine texture and surprisingly, the aquamarine color of the water though it was gloomy. There was no one in the shore, but only me. And I just love to hang around at that very moment, savoring the serenity and stillness of the place. 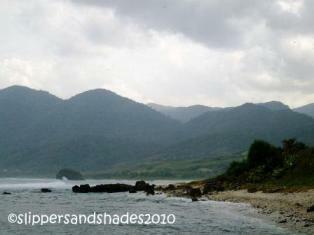 The cove had a unique charm which I would surely want to go back, come another Ilocos Norte getaway. If there was a sunshine that time, I’m sure my photo is more picture-perfect. Our resting place was in Barangay Saud. We had a reservation of three rooms for 3 days and 2 nights stay in Cathy Homestay. We cooked for our dinner and after washing the dishes and cleaning the kitchen, we all gathered near the beach for a bon fire activity. We didn’t swim because it was so cold. It seemed everyone still had a full energy as we had our night time fun, laughing at the top of our lungs. I only have few more days with my team for I’ll be moving to another company. This adventure is just one of our memorable getaways that I will surely cherish in my life. I will be missing going to beautiful places with my good friends whom I had with for quite a long time. It was almost 11 pm when we went to our rooms and settled to bed. We need energy for tomorrow’s another exciting adventure. Good night Pagudpud!